Diet in the zoo: monkey chow, apples, oranges, potatoes (sweet and white), leaves, lettuce (romaine and iceberg), tomatoes, and bark. Head and body, about 30" Tail length, 2-3" Shoulder height, about 20" Males weigh more than 60 lb. Females are about half that. They have dark hair through out most of their bodies except for their faces and butts which very colorful The color on the faces is very brilliant, especially in the males. Why are the faces and backside blue? The bright blue color comes from the reflection of light from a region of parallel fibrils of the protein collagen in the connective tissue of the animal's face and backside. The red color is from blood vessels running close to the skin, and increases during excitement. Comments about the Mandrills of the Fort Worth Zoo. The care-taker that came to my aid was Jenny. She was notably polite and answered all of my questions fully. I asked Jenny many questions about the group. Some of them were about what they fed them, how many they give birth too, sleeping habits, aggressiveness, use of vocals, their senses relative to humans, and things they do in the wild. They sleep from sun down to sun up in cages because they don't have an exhibit indoors. Digging is a favorite pastime. They give birth to one young and their gestation is about 8 months. The females are the care-takers for the young, the males won't have anything to do with them. They reach adulthood at about 7-8 years old. 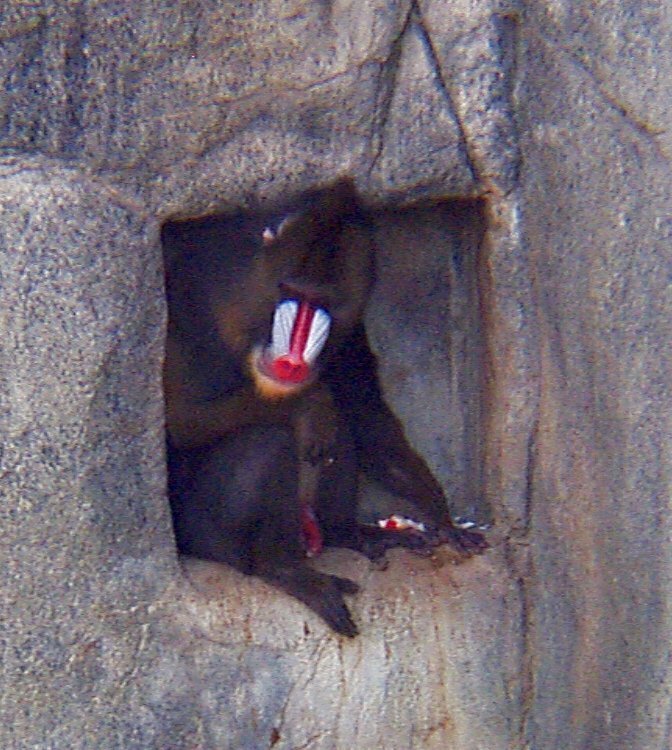 There is a birth control for most primates, but not for Mandrills. They were very aggressive and territorial. Bobbing of the head and barking is a signal to stay away. Another vocal ability is a high pitched screech, but the use is unknown because it is random and rare. Their hearing is excellent and their sense of smell is even better. Their ears are about the size of human's, but a little more pointed (almost like Spok's). Their exhibit is surrounded by water which keeps them in place because they don't like water much. They may venture about feet deep, but that's as far as they go. Before I went looking for a care-taker I wanted to observe the Mandrills for a thirty minute period of time. In addition to the male, Nelson, there are three females: Jonzey (the main female), Winnie (the second female and is the only one who likes to be touched by the care-takers), and Beko (the third female and the punching bag of the group). They were all doing their own thing. The one thing that caught my attention was one of them (Beko) was always aware of where the others are at all times. She would look over her shoulder periodically to verify the positions of the others relative to her own. If they moved, she moved as well to ensure her distance. The other thing that I noticed was the energy of these primates. There wasn't a single one of them lying down or sleeping. Fort Worth Zoo Keeper. "JENNY"
Elizabeth Pennisi. What's behind a blue behind? Science Now (21 May 2004).